We exist to help women choose life for their babies, have healthy pregnancies and become more nurturing, self-sufficient parents. Mother Teresa commented, “It is not the magnitude of our actions, but the amount of love that is put into them that matters.” The Women’s Care Center has certainly excelled in both their love and actions over the past 3 decades as they’ve provided resources for women facing crisis pregnancies with great compassion. 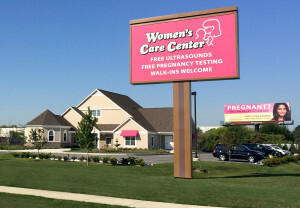 Dr. Janet Smith, a young Notre Dame professor, who established the Center in 1984 likely never envisioned that they would be seeing 24,000 women annually at 24 centers in 8 states, making Women’s Care Center the largest pregnancy resource center in the United States. Though it has multiplied its locations Women’s Care Center has stayed true to its Nine Promises. Promises such as; “we promise to welcome everyone who walks through our door as though they are family”, “we promise to refrain from judgment and to love unconditionally every woman we serve” and “we promise to love and serve every mom and baby we see at no cost to them” have ensured that an environment of compassion and dignity will continue for years to come at each of the Center’s locations. A second distinguishing marker is their educational support to the women. In 1998 they offered the first parenting class which was incentivized with 10 free diapers and a casserole dinner; five moms showed up. Today counseling, one-on-one education, and parenting classes continue to be strong aspects of the Women’s Care Center’s love in action. On average, moms now return 7 times for these educational services and by participating, they earn cribs, diapers and brand new clothing in the Center’s “baby store”. These are not handouts, but truly a hand-up. Programs such as these have enabled their clients to stay in school and take steps to self-sufficiency. In addition to their ongoing support to young moms the center also distributes tens of thousands of baby and children’s books to promote reading habits in the young families. 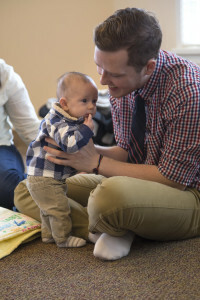 Hayden, pictured with son Cullen, states that “It’s nice knowing that you are not just here until the baby is born and then, ‘See ya!’” After dozens of visits and parenting classes, Hayden and his girlfriend Lili are excellent parents and both will start college this fall. For 32 years, Women’s Care Center has been funded almost entirely by private donations. Those donors are the Center’s partners and their personal engagement is vital to the long-term success of the organization. As engaged partners these supporters have access to great outcomes, success stories and have made it possible for the Women’s Care Center to earn the reputations as a “results driven ministry”. This wide network of supporters recently enabled the Center to raise $454,980 on the national Give Local Day 2015, surpassing 9,000 participating agencies in donations. To ensure long-term sustainability a substantial endowment has been created. A former client sums up well the Women’s Care Center’s outcomes of helping women choose life for their babies, have healthy pregnancies and become more nurturing, self-sufficient parents.